Defense Minister says Hamas 'hasn't fired a bullet' since Operation Protective edge, explains deterrence key to Israel's security. 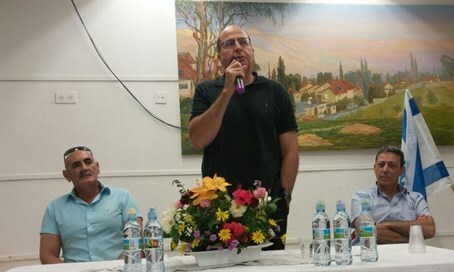 Defense Minister Moshe Ya'alon paid a visit to the community of Maalei Efraim in the Jordan Valley on Tuesday, and addressed students from the local high school and hesder yeshiva. During his speech, Ya'alon explained the importance of military service, and mapped out some of the key security threats facing the State of Israel - specifically, the shift away from conventional military threats to terrorist attacks driven by incitment. Ya'alon opined that since no prospects exist for a real lasting peace in the foreseeable future, Israel needed to act in a calculated fashion to ensure its continued security. "We sanctify life and over there, there are some who sanctify death," he said of the Muslim world, underlining the difficulty the Jewish state faces against enemies determined to die killing Israelis. Israel's most valuable tool in fending off such enemies is deterrence, he explained - or more specifically, by making it clear to its foes that they can never hope to attain their objectives. That can only be achieved "via force, so the enemy knows he will not be able to expel" the Jewish people from their land. As an example, Ya'alon cited the prolonged period of calm along the border with Hamas-ruled Gaza - once a front line of rockets, mortars and terror tunnels. While occasional breaches of the 2014 ceasefire have occurred, those attacks have been from rival factions to Hamas - mostly in an attempt to drag the Islamist group back into a confrontation with Israel it cannot stomach - and have been relatively minor in nature. "Why have Hamas not fired a single bullet since (Operation) Protective Edge?" he asked rhetorically. "Because they are deterred." "On the other hand, I appreciate that there are Gazans who need to live, which is why 900 trucks laden with commercial goods pass (into Gaza) every day, and we ensure there is drinking water and electricity," he added of Israel's extensive humanitarian efforts to help civilians in Gaza. During the Q&A session, Ya'alon fielded a question about his controversial statements in which he condemned the soldier who killed a wounded terrorist in Hevron, even prior to his trial. Ya'alon defended his actions, saying that even the soldier's commanders on the ground realized that a severe incident had taken place - and hence lodged a complaint against the soldier themselves. He further insisted that it was important for Israeli leaders to quickly condemn the incident so as not to grant ammunition to Palestinian leaders to use it as part of their incitement against Israel. At one point, when challenged about his labeling the incident (now treated as manslaughter) as "murder", Ya'alon raised his voice and answered the student: "Don't engage in manipulation! The word "murder" only entered the discourse after investigators warned the soldier that the severity of the charges which could be leveled against him could include murder charges." The IDF, he said, serves as the moral backbone of the country and "we must not lose it." Ya'alon also pledged to look into ways to alleviate the de-facto freeze in construction in Judea and Samaria, in response to another questioner, but did not elaborate.